For many people, trampolines offer nostalgic memories of childhood – however use of this versatile equipment can extend far into adulthood. Bouncing on a trampoline is known to have a variety of benefits for our physical and mental health, and can even boost productivity. Trampolining provides an excellent whole-body workout. Getting your body moving helps release endorphins, a group of hormones secreted within the brain and nervous system. As you bounce, your heart rate will increase, releasing a surge of endorphins that raises your energy levels. If you’ve got a lot on your plate, a surge of endorphins may be just what you need to get the job done! Those same hormones that regulate your energy levels, can also improve your mood. Jumping on a trampoline can help activate the body’s opiate receptors, leading to a natural feeling of positive euphoria. Boosting your mood and staying positive is exactly what you need to stay focused on the task at hand! Nothing stunts productivity like stress. Unfortunately, stress in as inevitable part of daily life, particularly with the pressures of work, home and family commitments. 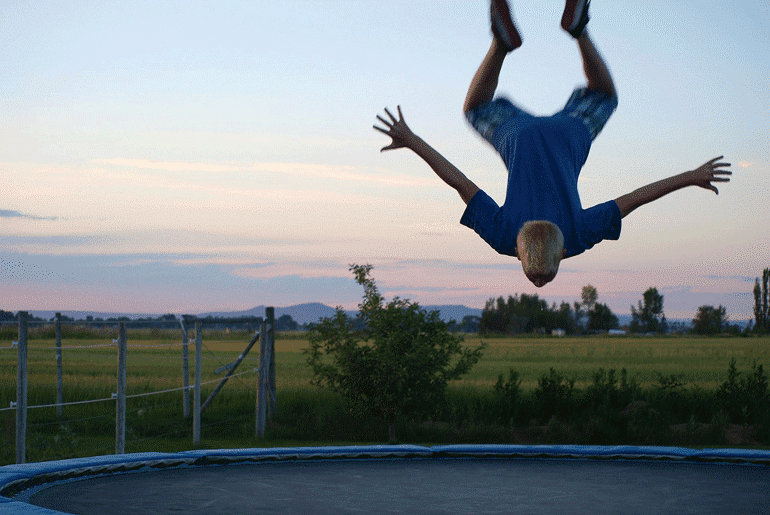 Physical exercise, such as a jumping on the trampoline, is vital for maintaining mental health and wellness. Regular exercise (such as trampolining) can help reduce the level of your body’s stress hormones, such as adrenaline and cortisol. In time, lowered levels of stress will lead to an uptake in productivity. Just 30 minutes of trampolining can increase the levels of oxygen-rich blood flowing to your brain. This can help improve your concentration, alertness, and even boost your creativity! Meditation through movement may be just what you need to gain a clearer direction. While jumping on a trampoline is great fun and an excellent workout, it doesn’t require a lot of thinking. For someone who has a lot swirling through their head, trampolining offers an effective way to destress and refocus. The repetitive action of jumping on a trampoline may also help you ‘switch off’ and allow your mind a well-earned break. When you’re ready to return to your task, you’ll feel refreshed and prepared to tackle the workload! Provides effective exercise, and enjoyment for all ages! Vuly Play are an Australian based company whose mission is to contribute to the world by making healthy play both safe and fun - encouraging a better lifestyle for humanity.